Claims it's for cybersecurity – but whose security exactly? The Taiwanese government intends to block Google's public DNS service, citing cybersecurity concerns. The question is whether those concerns are the government's or its citizens', with the government pushing its own DNS service – a setup that is typically used to spy on people's internet communications. The announcement comes, somewhat unusually, in the form of a PDF of a presentation posted to the Government's Internet Service Network (GSN) news page. 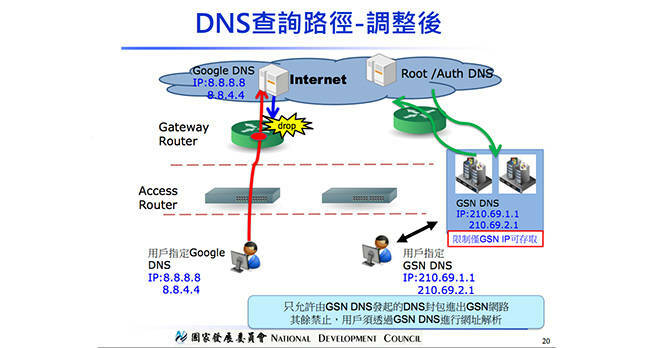 Going through the presentation – written in Chinese – the GSN outlines the problem, as it sees it, with Google's DNS service, repeatedly highlighting DNS spoofing techniques and other cybersecurity issues. "If you can reduce the use of restricted sources, then with the appropriate DNS protection mechanism, you can effectively reduce the risk of DNS spoofing," it notes, with numerous DNS diagrams that make it clear that Google's public DNS system should be viewed as one of those sources. One diagram shows Google DNS service being used to circumvent a firewall – which is precisely what many Chinese citizens used it for in an effort to get around the Great Chinese Firewall. Another shows packets being dropped while using the service. In contrast, the Taiwanese government's slides show the benefits of using its own DNS service (at 210.69.1.1) to search the internet, with ISP HiNet, half owned by China Telecom and run by Taiwanese giant Chunghwa Telecom, promoted in many of the examples. It's not clear whether the block on Google's DNS service will be nationwide or solely for government employees. Or whether it will only be government employees that will be obliged to use the government-provided DNS service or all citizens. But as one slide makes it quite clear, in both pictures and writing, only DNS requests that go through the government's DNS service will be allowed, with all others prohibited. No date is provided for when this new approach will be introduced. One of the main uses of Google's freely available DNS is for people who are stuck behind government firewalls that block or censor specific services or websites. By providing a DNS service, the internet service provider can effectively decide what you see and what you don't. It is also possible to use such a service for mass surveillance of citizens. Google offers its service as an open alternative – although the search giant is tight-lipped about what use it makes of the vast amounts of data it receives as a result. It is possible that the Taiwanese government has simply decided to improve its employees' cybersecurity efforts by locking down direct access to the public internet to make sure it only passes through its services – which is a legitimate, if unusual, approach. However, it may also be no coincidence that earlier this year, Taiwanese internet users reported widespread problems with accessing Facebook, YouTube, Google and Gmail. Only those using HiNet's broadband and mobile services were affected. Following an investigation, the National Communications Commission (NCC) announced that the problem was due to "router overload" – and refused to give any further information.